Anne (of Green Gables) had fetal alcohol syndrome (FAS)? Such is the conjecture of academic Helen Hoy, as reported in Maclean’s June 21st issue. She interprets Anne’s “challenging behaviours” as symptoms because she sees some of these in her adopted daughter, who suffers from FAS. As readers, we all bring to stories and characters aspects of our own experiences, prejudices, and desires. If Hoy chooses to see pathological behaviour in Anne, then that is her personal reaction to the character. There is no evidence in the book that Anne’s mother drank to excess, or even at all, or that Anne actually fits the true profile of a child with FAS. And is her behaviour pathological? Anne is a spunky, outspoken, imaginative girl that so many of us admire, especially as children. She holds her own with adults in an era and society where children were to be seen when required, but not heard, and manages to endear herself to them without giving up those qualities that we love in her. I expect that generations of young readers have looked to her as a role model of how to endure and triumph in difficult situations, as well as being entertained by her antics. Scholars are not only grasping at straws when they try to recast and even exploit popular fictional characters, but also doing a disservice to the author and the fans. Professor Laura Robinson conjectures that Anne had “lesbian urges”. Hoy claims that seeing Anne “as developmentally challenged, with her impairments the source of some of her charm” will help to see FAS in a new light. The fact that Anne not only looks after Marilla, but also marries and raises her own children may actually put unreasonable expectations upon children with FAS and their caregivers, who often have to support them for life. 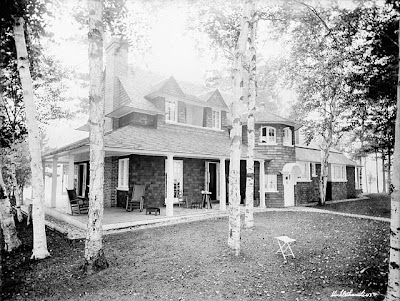 This 1905 photo evokes for me the ethos of Edwardian Muskoka. Much of cottage life revolved around the expansive veranda where cooling summer breezes, redolent with pine, refreshed you until your next dip in the lake. 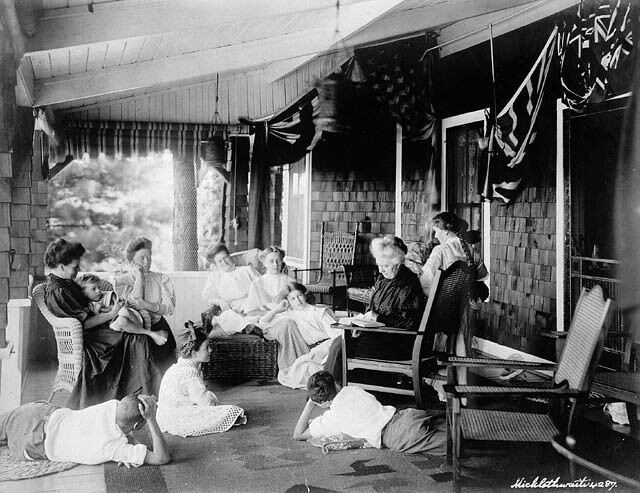 It was an outdoor room where families gathered to hear grandmother read or to entertain friends. And many of these cottagers spent the entire summer at their lakeside homes. For some, cottage life hasn’t changed that much since the Age of Elegance, except for the clothes. You can still relax on verandas that embrace shingled cottages, and hear the distinctive creaking and slapping of those old-fashioned screen doors that remind you that it is summer. Below is a Mickletwaite photo from 1908. Doesn’t it invite you to climb into one of those rattan rockers and savour the moment, perhaps with a good book and a glass of wine? Novel Part of Chautauqua Revival! 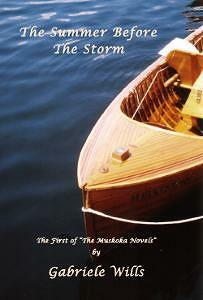 I’m thrilled and honoured that my novel, The Summer Before The Storm, has been selected as one of the six “must-read” books of the Muskoka Chautauqua Reading Circle for 2010. "Muskoka Chautauqua is a vibrant arts-based community where visitors come for personal growth, enrichment and renewal. 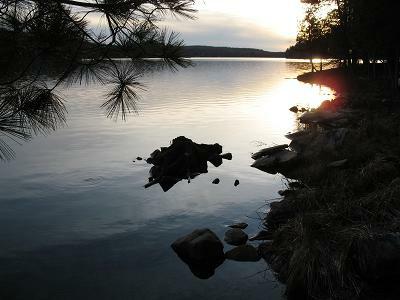 It is an uplifting cultural hub that encompasses the arts, education and recreation; a place removed from the day-to-day world, where practitioners and leading thinkers of our time share innovative and creative ideas; a place where the arts blend with the natural beauty of Muskoka and where the human spirit – and all its hidden talents – may be liberated … and soar." From an impressive list of books nominated by the public, six were chosen and announced at a ceremony on Saturday June 12th at The Rosseau, located quite close to the original Muskoka Assembly Chautauqua on Tobin Island. For a glimpse of that, see my blog “Naked Poets, Free-Thinking Clergymen, and An Enchanted Island”. The Summer Before The Storm, the first of “The Muskoka Novels”, evokes the Age of Elegance in the summer playground of the affluent and powerful. But their charmed lives begin to unravel with the onset of the Great War, in which many are destined to become part of the “lost generation”. The novel and its sequel, Elusive Dawn, have touched the hearts and minds of thousands of readers worldwide. Focus on Books called them “Historical fiction at its best”. 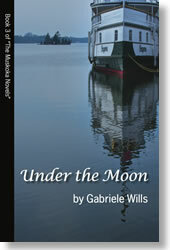 Find out more at TheMuskokaNovels.com.